In this Photoshop Effects tutorial, we're going to look at a classic Photoshop effect for wedding photography, placing the wedding couple inside a wine glass. This is a very easy Photoshop effect to create, requiring nothing more than a few basic tools, a layer mask, and a few minutes worth of effort. We'll be finishing off the effect with a slightly more advanced blending option, but "more advanced" definitely doesn't mean "more difficult", as we'll see. If you're not into wedding photography, you can use this Photoshop technique to place images inside any glass object, like a bottle or even an hour glass, and it also works great for placing images inside bubbles which is always a fun thing to do. Any recent version of Photoshop will work just fine. Drag out an elliptical selection around the wedding couple. Add a feather of about 15-20 pixels to the selection to soften the edges. Click OK to exit out of the dialog box. Click inside the photo of the wedding couple and drag them into the photo of the wine glass. Don't worry if some of your edges around the couple look like they're cut off, as mine do at the top and on the right. We'll be fixing that in a moment with our layer mask. Also notice how the edges appear nice and soft (except of course for the areas that appear cut off), and that's thanks to the feather we applied to the selection. Once you've dragged the wedding couple into the other photo, you don't need to have their original image open on your screen anymore, so you can close out of it if you wish. 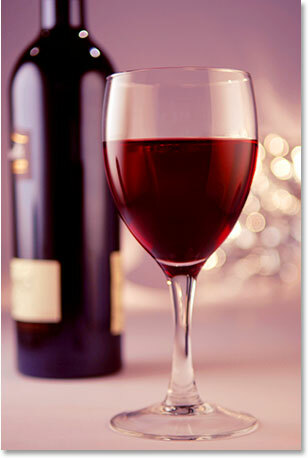 We need to move the wedding couple into position in front of the wine glass and we'll most likely need to resize them as well (I certainly need to with my image), and we can do both of these things using Photoshop's Free Transform command. Press Ctrl+T (Win) / Command+T (Mac) on your keyboard to bring up the Free Transform box and handles around them. To move the couple into position, simply click anywhere inside the Free Transform box and drag them into their new location with your mouse. 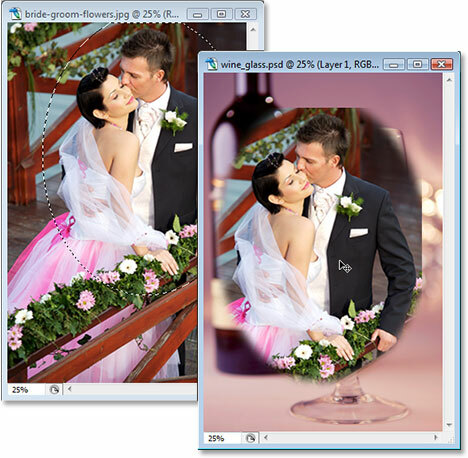 Move and resize the couple as needed with Free Transform. Press Enter (Win) / Return (Mac) when you're happy with the size and location of the couple to accept the transformation. Click on the "Layer Mask" icon at the bottom of Photoshop's Layers palette. You'll see a layer mask thumbnail appear to the right of the layer preview thumbnail. "Layer 1" now has a layer mask thumbnail to the right of the layer contents preview thumbnail. wedding couple image to reveal the edges of the wine glass underneath them. If you make a mistake as you're painting, either press Ctrl+Z (Win) / Command+Z (Mac) to undo it or press X on your keyboard to set your Foreground color to white, paint over your mistake, then press X again to set your Foreground color back to black and continue painting around the edges. 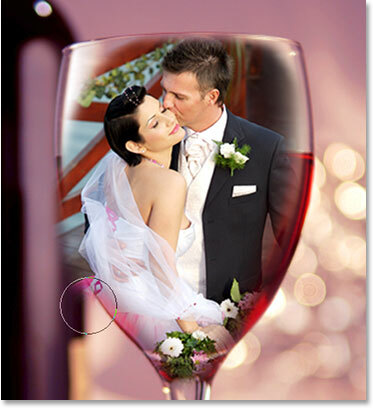 The image after containing the wedding couple inside the wine glass. Click on the "Layer Styles" icon at the bottom of Photoshop's Layers palette and select "Blending Options" from the top of the list. Drag the white slider for the bottom "Blend If" bar towards the left until you begin to see any highlights or light reflections reappearing in the glass, then release your mouse button, hold down "Alt" (Win) / "Option" (Mac) and continue dragging the slider to split it in half and create soft, smooth edges for the highlights. And there we have it! 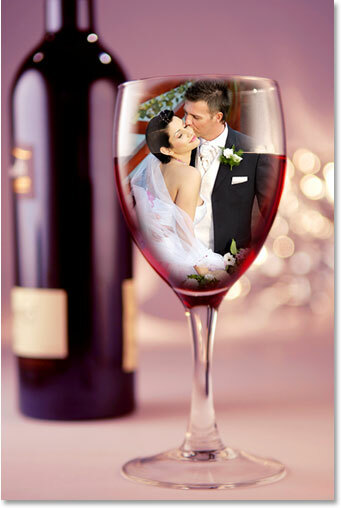 That's how to place a wedding couple inside a wine glass with Photoshop! Check out our Photo Effects section for more Photoshop effects tutorials!